Do you want to index your new blog content super-quick on Google? You’re on the right place. This blog post helps you to quickly index your new blog posts on Google. The strategies that I mention in this blog post have worked like a charm in indexing my blogs. Before reading this blog post, you need to remember one thing. The index time is dependent on the crawl rate (the rate at which Google bots crawl your content). This means higher the crawl rate greater the indexation speed. All the tips you learnt when it comes to optimizing your site for crawlability also comes in handy for speeding up the indexation. How to know whether your blog is indexed or not? For this, you need to make use of domain name search modifier. From the above screenshot, I can conclude that Google has indexed 25 of my site’s webpages. You need to at least be able to index your website before thinking about ranking it. Section 1: How to index a new blog? Section 2: How to index new blog posts? 1 How to index your new website quickly? 2 How to index your new blog posts quickly? 2.10 How to know when blog posts are indexed? How to index your new website quickly? Google Search Console is a free platform provided by Google that helps bloggers and content publishers to check their site’s indexing status and Google visibility. In order to add your blog to the Search Console, you need to sign up with your Google account at Google Search Console. There you need to add a new web property, enter your site name. Later, you need to add the verification code provided by the tool and add it to your blog. The code can be added to the theme’s header.php or if you are using a child theme, you can add it using plugins like Insert Headers and Footers for WordPress. Once you verify your site, it will be a sign to Google that your site exists. A sitemap is nothing but a page that contains the links to all the pages on your blog. When you publish any new content on your blog, the sitemap will be updated with it’s URL. Every time Google crawls your site, it’ll find it easier to just visit the sitemap page and check if there is any new content on your site to index. 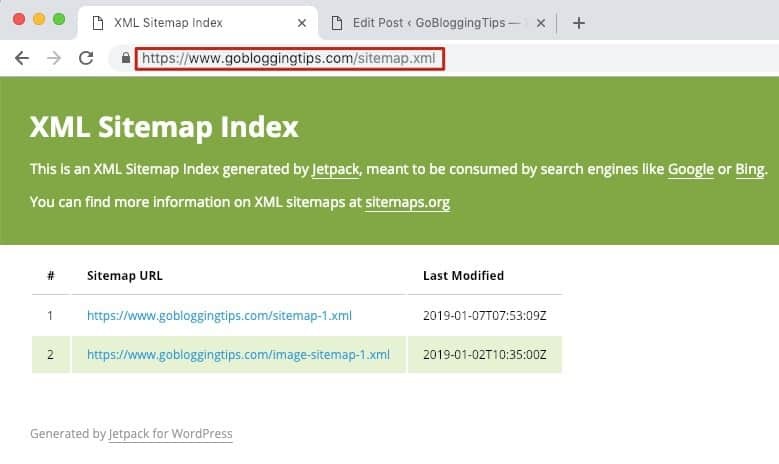 You can create a sitemap to your blog with the help of JetPack Plugin, Yoast SEO or Google XML Sitemap plugin. Once you activate the plugin and enable the sitemap feature in it, go to yourblog.com/sitemap.xml there you can find the XML file listing all the pages on your blog. Now login to Google Search Console, go to Sitemaps under Crawl section. There enter the sitemap sub-URL and hit submit. By submitting sitemap to Google, you are making the search engine easily crawl your site, discover and index the new content you publish. Google Analytics is one of my favorite free tools by Google, that helps track the website visitors in every possible way. For integrating Analytics with your blog, you first need to sign up for Google Analytics. Now you need to go to admin section. There you need to add a new account. There you need to enter the details of your site. After it, “Get the tracking ID”. Now you need to paste the tracking ID using plugins like Analytify or paste in the integration code in your header file. Now after the integration, the traffic to your site will be tracked and data is collected. It also helps Google in determining the quality of your content. It’s just a strong ping for Google to consider your site. Creating social media profiles of your site, once you launch your blog helps a lot in indexation process of your new blog. You can create profiles and as well as pages on social media profiles. In most of the social media profiles, you can include the URL to your homepage. Although the link is nofollow, it helps Google discover your blog. Make sure you include a link to your site on the profile page. Like, as you can see in the below screenshot. The crawl rate of Google on popular social media sites are high. So, even if the links do not return link value, it helps in indexation of your content faster. Apart from social media sites, there are other popular sites where you can create profiles on them and get a link back to your site. Below are some of the sites, where you can create profile links. Here is the link example from my About.me profile. Like this, there are many websites where you can create your profile and include a link to homepage of your website. The blog directories witnessed a bad rap due to the excessive spam. However, there are still some of the highly moderated blog directories that do offer some SEO and indexation benefits. However, I recommend not to submit your site in more than 2-3 directories. Because a site with dozens of low-quality directory links received unnatural links penalty. Let me list some of the good blog directories. Consider submitting your blog to these directories, not all of them. Do it naturally, not all at once. Apart from storing bookmarks on your browser, you can also do bookmarks of your favorite web pages on certain sites and browse the bookmarks of others or yours when required. These sites are called social bookmarking sites. You can automate the process of submitting your new content to these bookmarking sites using free services like Social Marker, OnlyWire, and SocialADR. There are various social bookmarking sites out there, that demand manual submission. Create a profile on these sites, and start sharing the awesome content across the web along with your content too. If you overshare your content on these sites, you tend to get less traffic and exposure gradually. That’s the mistake I did in my initial days of blogging. When more people starts visiting your site and interact with your content, Google crawls your site more often. You may have noticed that there are many sites which collect the data like whois data, statistics, website value estimator tools and list of IPs of all the sites across the web. These sites give you a couple of nofollow backlinks, that helps Google discover your content. It would be a difficult job for you to submit to your site to these sites all at once. There’s a tool called IMT Website submitter that submits your site for up to 1400 places. However, you can limit the places you want the site to submit your site to. I usually keep it at 50. Although submitting your site is not going to help you for SEO, they do help in indexation process. I personally use this service for all my niche sites, when it’s new. Blog commenting in one of the most effective ways to build some traction to your blog when it’s new. It’s also potentially a grey-hat SEO strategy when done in a right way. Keep the anchor text as your author name. Most of the comments give you a nofollow comment, which has little to do with SEO. It has more to do with link diversity in the long run. When the site is new, it helps you quickly index your site. Always try to comment on the blogs that create content more often.They tend to have high crawl rate. It may be like news sites or authority sites. Don’t spam, tend to leave high-quality comments with your avatar. How to index your new blog posts quickly? Google has the authority to not index your website, if your website content quality is not upto mark. In fact, John Mueller – Webmaster trend analyst at Google, went a step further and said. We don’t index all content, that’s completely normal. In your case, we are indexing a bunch from your website already. However, looking at the content, it seems a bit questionable to me, and I feel there’s still a lot of work to be done with regards to its quality. For example, it’s filled with “top 10 in 2019” lists — when it’s not even been a week of 2019 so far. On top of that, the content appears to be spun/rewritten from other websites, which is spam and against our webmaster guidelines. My recommendation would be to take the site down and start over fresh with unique, compelling, and high-quality content that you spend time working on. Pick a topic you’re passionate and knowledgable about, and work to create real content of your own there, something that can stand the test of time, and which stands out against all of the competition as clearly the best of its kind. Make something awesome, don’t just make a website. If the content on your site is spun, rewritten, controversial, Google has the liberty to no index or complete de-index your site. So, make sure that the content on your site is of high-quality and written considering the end-readers in mind. There should be a good interlinking structure on your blog. The relevant posts on your blog should be tightly linked with each other. If you are following a silo structure on your blog, that’s very effective. If you don’t know what silo is, it refers to the process of thematically grouping the blog posts on your site and internally linking them each other other in the group. The moment you publish a new blog post, it’s very essential to head over to all the posts that are relevant to your new blog post and add internal links. This increases the link juice being flown to your new blog post and also makes the new content discoverable by Google. Having a good interlinking strategy in your blog is the best tip I can give when it comes to indexing your blog post fast. Nothing can even close to interlinking when it comes to speeding up the indexation process. If you have not submitted your blog to some blog catalogs like AllTop and BlogCatalog, you need to consider doing it. These catalogs instantly showcases your latest blog posts on their website thus increasing the chances of your new blog posts getting indexed by Google. The moment you publish a new blog post on your blog, you need to spend some time to promote it effectively on various social media sites and get quality traffic to it. You can consider promoting newly published posts on platforms like Facebook, Twitter, LinkedIn, and also pin the graphics of your blog on Pinterest. The goal here is to get as much social media traffic as possible, and also hopefully some quality comments on your blog. As more and more people start visiting your blog posts, it forces Google to crawl and index your new blog post. You need to encourage your website visitors to share the content to their social media fans on your website. You can do this by adding a call to action at the bottom of the articles and also floating social media share icons. For floating social media icons, you can make use of plugins like Social Warfare or Scriptless social sharing plugins. You can also make use of social locker plugins like Social Locker by OnePress to offer some exclusive content for people who share content on social media. The content will be unlocked only to those who share your article on social media. As your content gets more and more shares on social media, Google will quickly pick the article to their index. In one of my previous posts I have suggested that increasing the PageSpeed of blogs, increases the crawlability and crawl rate of your blog a lot. I can say that index rate is directly proportional to the PageSpeed of your blog. Google has a time limit within which it should crawl and index a page. To let Google crawl and index your blog post completely, it’s necessary to increase the PageSpeed of your blog. Increasing the PageSpeed of your blog provides Google much more time to crawl and index your blog posts. Along with the fast indexation process, high PageSpeed has several benefits which I have discussed in one of my previous posts. These tips should definitely help your website to be optimized for effective blog post indexation. This is one of the important things that you should do to speed up the indexation of your new posts. Keep your blog updated so that new traffic trickles in. Publishing new content also keeps your sitemap updated, so that Google can increase the crawl rate of your blog. If you publish two blog posts weekly, then fix two days of the week for publishing. By this, Google bots can easily determine when to expect new content on your blog. I’ve noticed this over and over again that whenever I take a long break from blogging, I’ll have a quite difficult time indexing my new blog posts in some of my sites. Even after following all the above guidelines if your new blog post does not get indexed, then it is recommended to use, fetch as Google feature. Fetch as Google feature indexes your blog posts within seconds or minutes. But it’s worthwhile to mention that, letting the new blog post index naturally is better than forcing them to index using fetch as Google feature. I have observed that, by using Fetch as Google feature, blog posts will be indexed instantly but not ranked instantly – especially for new blogs. To use fetch as Google feature, head over to Google Search Console and select fetch as Google under crawl section. Enter the new blog post URL in the text field, and hit fetch and render button. Later, in the resulting window, click on Submit to index button. After the indexation process of your new blog post, the entry will be marked as completed. However, I do not encourage using this feature unnecessarily. Creating an RSS feed of your blog, and submitting it to services like Google’s own Feedburner helps a lot to get your new blog posts indexed faster. If you are running a WordPress site, you can find your feed under example.com/feed. Now you can optionally direct all the feed traffic through FeedBurner service. Every time you publish or update blog posts FeedBurner will pick the update and sometimes inform Google about the new content. How to know when blog posts are indexed? To know the time taken by Google to index new blog posts, there must be some way. Well, here’s the solution, Google Alerts. Many of you may use Google Alerts for different purposes like competitor research, or to notify you when a particular product is available, and others. Google Alerts can also be used to send you a notification e-mail when your blog post is indexed. Below is the screenshot on how to set up alerts on index of new posts. As you can also notice in the screenshot, there is an alert preview. It previews the latest blog post indexed on Google as when I’m writing this post. Are you facing difficulties in indexing your blog posts faster in spite of following all these strategies? Then, let’s check some of the things. By default, WordPress will have this option unchecked. If it’s accidentally checked on, check it off. Go to your Search Console account, and go to Coverage. If there are any abnormal crawl issues on your site, it may mean that your robots.txt file is somehow blocking access to some resources on your site to Googlebot. You can enter in any of your blog post’s URL, check whether the Google is allowed to crawl and index it. Also check whether your robots.txt file contains any code that’s blocking your website. In Search Console under Manual Actions, check if there are any manual spam actions on your website. If there are any issues here, you may want to consider removing the spam on your site and send reconsideration request to Google. For a new blog it’s all about proper promotion. If your new blog have enough quality content and you promote it properly on social media, email outreach, blog commenting, it’s not a big deal to index it. However, for speeding up the indexation of new blog posts, you need to implement a proper internal linking structure on your website. You need to also include a widget to your recent posts in the sidebar of your site. These are the two most effective strategies for indexing new blog posts faster on Google. Hope you guys found this blog post helpful, let me know if you have any techniques to index your blog posts faster on Google. I like that you mention how many comments you leave on commentluv blogs after a new post. I have always wondered about these things as I have recently started my own website. Don’t focus only on leaving comments on CommentLuv blogs. Try out other strategies as well! I’m not a big fan of ping list either, never heard anyone being benefited from it recently. I trust the google fetch option even though I have read on other blogs that it is not recommended and I see that you too mention it, however even though I make sure not to miss use it on one page I have not had problems with it sometimes it has to be used when titles of pages are changed to advertise the days specials. Yes, for example during Black Fridays! Hello there! Your post is really amazing and forward to the point. Thanks for sharing. Nothing better than a long, insightful piece of content to end the day! This is a great article with fantastic advice on how to get blog posts indexed by Google faster. We have some clients who will undoubtedly be trying to do this when their new websites are launched, and we would link to share a link to this resource for them, whenever they ask. Do you mind if we link out to this page when they ask in future? P.S. I think that we will implement Google Feedburner on our own site, too. Thanks. Thanks,Your post is really informative for beginners.I will share it with my fellows. This is a great article it helped me improving page indexing and understanding concept behind feed burner as i was new in RSS Feed submission. Information is likely to more specific and relevant according to my needs, Once again a big thanks to you. Keep Writing Good Content. First of all, thanks for the good post, and love to learn new things from BloggingX always, but I have a query, there was one blogger friend of mine, and he shared one technique with me that doesn’t work for me. Trick: Use old blogger.com blog account, use old indexed page or post and put your new post URL in that and re-publish it and share that blogger post on social media. is it worthy to do this trick? Share your thoughts about it. Great article. But the new search console has replaced the option of “Google Fetch” with “New URL Inspection”. Now we can only submit the page but we can not have access to the information that which page was submitted at what time & date.